As the wearable technology space grows day by day, we’ve been thinking a bit about the demands these devices put on users to surrender “body real estate” in exchange for the agency, convenience, multitasking, health tracking, and other functions these gadgets promise to provide. 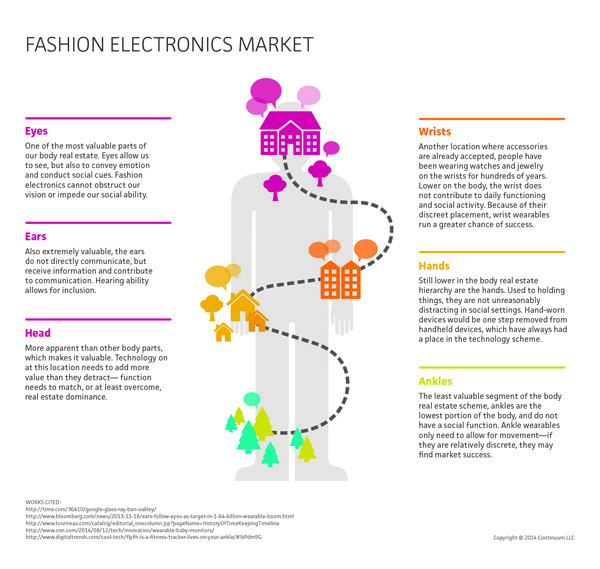 Rather than consider them “wearables,” we’re arguing for a shift to naming them “fashion electronics”—products that connect users with technology but need to consider themselves more as apparel than wearable computing devices to secure the long-term consumer adoption they are seeking. Marisa crafts visual narratives that encourage meaningful customer experiences. To her, people are the key component to a successful brand story. Combining ethnographic research and design, she translates brand into deliverables that manifest across industries. She has developed UI architecture for a next generation cardiac medical device, designed the spatial experience of a corporate exhibit to promote member-employee empathy within a healthcare company, and re-imagined the digital onboarding experience for a premium financial service. Marisa graduated from the University of the Arts in Philadelphia with a BFA in graphic design and a minor in web design.